The Da Vinci Code movie took $224m (£119m) at box offices around the world at the weekend despite controversy and bad reviews, its distributor has said. That is the second most successful film opening in history, Columbia said. It could not beat Star Wars: Revenge of the Sith, which made $253m (£135m) in its first weekend last year. The thriller, based on Dan Brown's novel, also topped the US and Canadian box office, taking $77m (£41m) in its opening weekend. 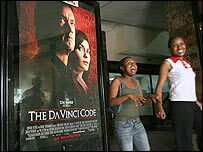 Many critics were disappointed with The Da Vinci Code film, while Catholic groups around the world have protested against its portrayal of the church. The film's North American takings are some way behind the record for a debut weekend, which is held by the $115m (£61m) Spider-Man earned in 2002. Outside the US and Canada, though, The Da Vinci Code will have broken the record for ticket sales if the figures are verified, making $147m (£78m) in three days. The previous best was the $145m (£77m) that fans outside North America spent on Star Wars: Revenge of the Sith. The movie, which stars Tom Hanks, Audrey Tautou and Sir Ian McKellen, is based around the theory that Jesus married Mary Magdalene and their descendents survive today. 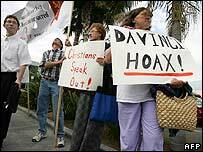 But the storyline has offended many, with church figures in places from the Vatican to Moldova denouncing it. 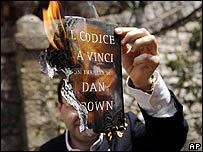 In Rome members of an ultra-Catholic group, Christian Militants, picketed some cinemas, chanting: "Dan Brown remember you will also be judged by Christ". Scuffles broke out as two Italian local councillors burned the book in the main square of the village of Ceccano, 70 km (43 miles) south-east of Rome, on Saturday. On Friday the American Society for the Defense of Tradition, Family and Property, took out a full-page newspaper advert calling for prayer vigils outside at least 1,000 cinemas. In India censors demanded a disclaimer to say the film is "a work of pure fiction" - leading the film company to postpone its release indefinitely. China's state-backed Roman Catholic Church is urging its members to boycott the film, while Thai censors want to cut the last 10 minutes because they are "blasphemous". But director Ron Howard has said: "This is supposed to be entertainment. It is not theology. It should not be misunderstood as such." He has also called the poor reviews "frustrating" and "disappointing". The film is a "stodgy, grim thing", industry bible Variety said, while the Hollywood Reporter bemoaned its "stiff, unappealing performances". In the UK the Guardian newspaper said it was a "two-dimensional thriller which, for an awful lot of the time, neglected to thrill". Will the film of The Da Vinci Code fan the flames of controversy?